What is Charcoal Toothpaste and Does it Work? Chances are you’ve seen all the social media posts raving about using charcoal toothpaste to whiten your teeth. Its popularity has soared over the past few years, and many people are raving fans of it. But what is this gooey black stuff that everyone seems to be using? Does it actually work? Our dental office in Nottingham wants to help get your questions answered. Question 1: What is Charcoal Toothpaste? When you first think of charcoal, we’re willing to bet you envision a gray rock that’s typically used for grilling food at the annual family picnic. Charcoal toothpaste isn’t made of that, but rather from activated charcoal. Activated charcoal is a form of carbon that’s been processed to have tons of tiny pores. In relation to oral health, it’s believed that these pores can absorb stains, tartar, and bacteria that may be lingering on teeth. Question 2: Is Activated Charcoal Safe to Put in Your Mouth? Activated charcoal has been used for over 2,000 for a variety of healthcare reasons including dental uses. In fact, the ancient Romans’ toothpaste consisted mainly of charcoal powder. As time progressed, activated charcoal was used to help victims of poisoning. Some hospitals may still utilize this technique today. Question 3: Does Charcoal Toothpaste Whiten Teeth? It turns out that the claims about charcoal toothpaste are in fact true. Charcoal toothpaste can be effective at giving teeth a whiter appearance by removing surface stains. However, if the staining is deeper, activated charcoal toothpaste probably isn’t your answer. 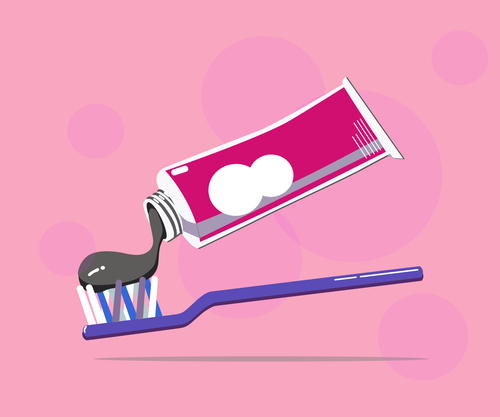 Question 4: Should You Use Charcoal Toothpaste? Essentially it’s your decision to use or not to use charcoal toothpaste. But the American Dental Association (ADA) warns against is repeated use. The abrasive texture of charcoal toothpaste can wear away tooth enamel and leave your teeth exposed to bacteria. Diminished enamel may also cause teeth to appear more yellow or darker, which probably isn’t the look you’re going for. If you’re looking for the best way to whiten your teeth, give our Nottingham dental office a call to schedule an appointment. We’d be happy to have you!